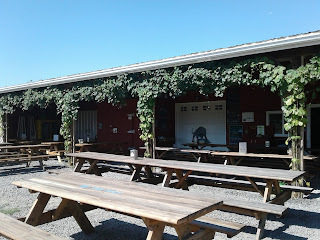 July 14 - We arrived early to Agrarian Ales at Crossroads in Coburg (video). That's right, at the "Crossroads". Maybe not THE Crossroads, but still pretty cool. 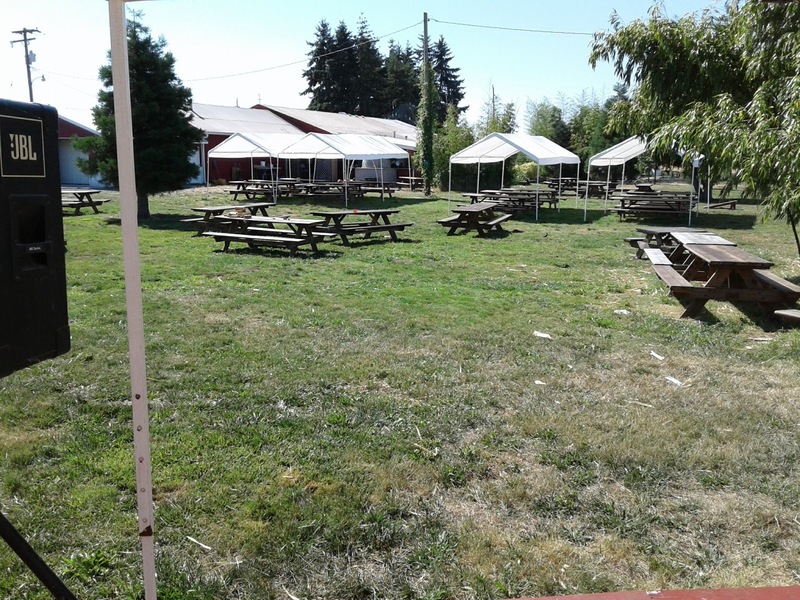 Agrarian Ales is a really hip Oregon farm that makes their own ales, grows their own everything. 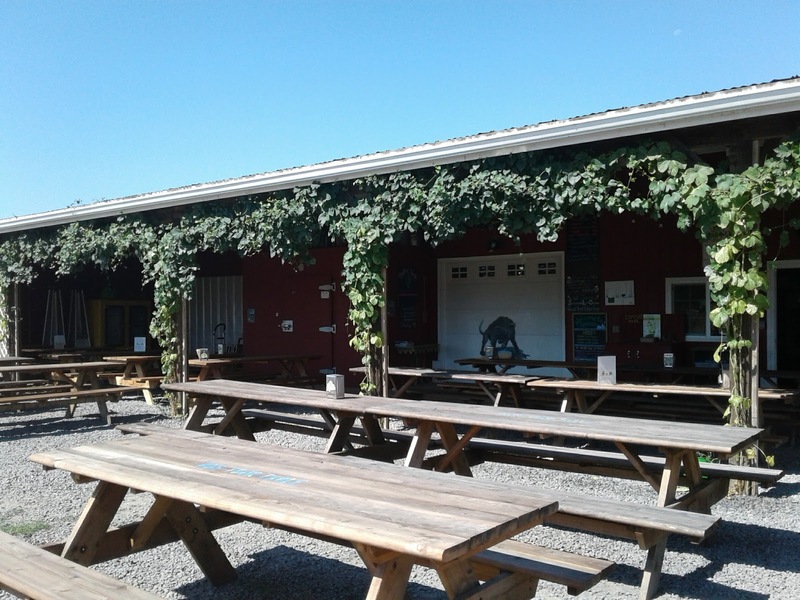 Agrarian Ales is a true farmhouse brewery in the heart of the beautiful Willamette Valley that serves seasonally-inspired, ingredient-driven beer & food. 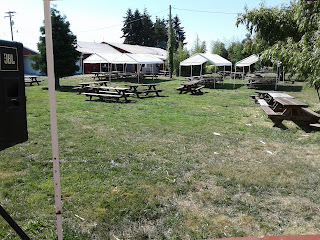 During the summer they host an afternoon of live music on the lawn behind their brewery and kitchen. Today we were the live music and a Brewers & Blues Against Hunger food drive. As a true farmhouse brewery, Agrarian Ales produces a constantly changing selection of seasonal ales. Using exclusively estate grown hops, chilies, produce, herbs, and well water, their Belgian influenced beers epitomize the name Agrarian, meaning “from the earth”. With the ever-changing tap list of 12 beers in their tasting room, you are bound to find a farm fresh brew to enjoy! The backyard is a 3-acre beer garden, with lawn, surrounded by tall trees and bamboo. The stage sat directly in front of a large fenced in a forest of bamboo. The Den (our RV) sat opposite the stage behind the bamboo, completely hidden. The stage was a 16' x 12' and covered for shade, unfortunately, at the time we performed the sun was set low enough to ignore the shade altogether and cooked us, well done on one side. Drummer Dave Roberts from The Blues Owns Band hosted on drums. Blue Own himself joined us today on harmonica and OMG! Blues can play, oh boy, can he play. Wonderful humble man, and so glad to have played with him. We were really excited to have Jimmy Haggard join us on guitar. Jimmy is the current President of the Rainy Day Blues Society of Eugene. Great player, and a really nice guy with great sense of humor. He was able to jam with us the first two sets. Also, joining us for the full set was Leaf, a truly amazing conga and percussionist. One surprise was when Curt, the security guard from Valley River Center in Eugene where we had boondocked for two days, showed up. He had told Sweet he made cigar box guitars and wanted to know if anyone would be able to play them for him since he didn't know how. Sweet had told him I would play them. I have never played one before and didn't know anything about them, but I was willing to try. 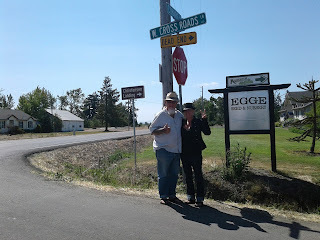 Sixx and Sweet at the Crossroads in Coburg, Ore.
Curt showed up with 4 really beautifully made guitars. I was a little worried about it honestly, but during the break, I heard him play the riff from Mannish Boy by Muddy Waters with a little brass slide. I said, "You know how to play", and he responded, "it's all I know". I asked how he tuned it, he said: "all I know is they're all tuned to G". That was all I needed, Mannish Boy in G. We opened the second set with special surprise guest Curt of his very own custom made cigar box guitar. It was a great jam, and for someone that had never played, he was great and said he has the "best time" and "thanks for helping him do this". The beautiful thing Agrarian Ales is they grow their own everything. If they themselves don't grow it, then one of their neighbors does. While enjoying an amazing green salad with lots of fresh spring lettuce; Rachel comments to the young man sitting beside her how excited she was about the salad, and he replied: "I grew that". He and his family including a new baby, come enjoy the afternoons there as well. They also serve a full menu of which I enjoyed a delicious brisket sandwich and wonderful fresh dinner salad. That night after the sun had gone down, and all had left. The farm was quiet and Sweet and I enjoyed a peaceful night sleep behind the bamboo of Agrarian Ales on Crossroads in Coburg Oregon. 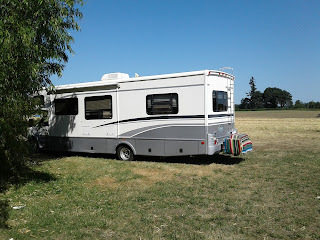 July 15 - Today we spent the first 2 hours frustrated after several attempts to get into an RV park, state park, or Lane County park. It was Saturday so all government offices were closed, so no getting reservations. Apparently, everything was full or sold out. 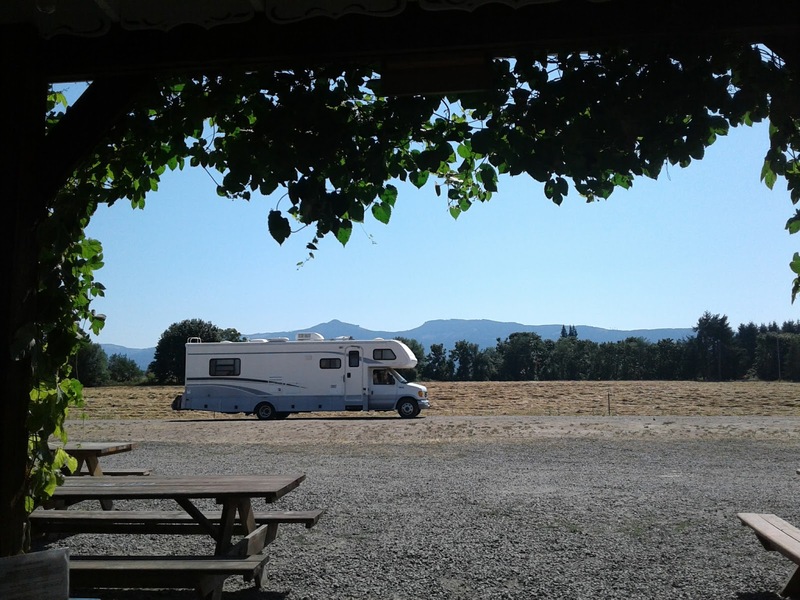 We drive to a couple parks only to find "Campground Full". We finally called Dave Roberts, our drummer from the previous day for some "local advice". He didn't have anything solid but mentioned there was a Sunday jam about 20 miles up the road past Springfield in a little place called Walterville. He said they would probably have a place to park. He gave us the name River Stop Cafe. We Google'd it, and gave them a call. The first lady didn't know anything about parking, so she gave us to the owner Heather. Heather informed us she had "truck parking right out front". We decided why wait until the next day, let's get there early and scope it out. When we got there we found that Walterville Oregon isn't much more than a parking lot, with the Walterville Post Office, Walterville Market and River Stop Restaurant and Pub, and parking for trucks. We went in, had the very best sweet potato fries we have ever had, two fresh brewed ice teas, pleasant conversation and all for only $11. After which, we checked out the market, purchased an IPA and then we relaxed the rest of the evening and watched a new Star Wars. 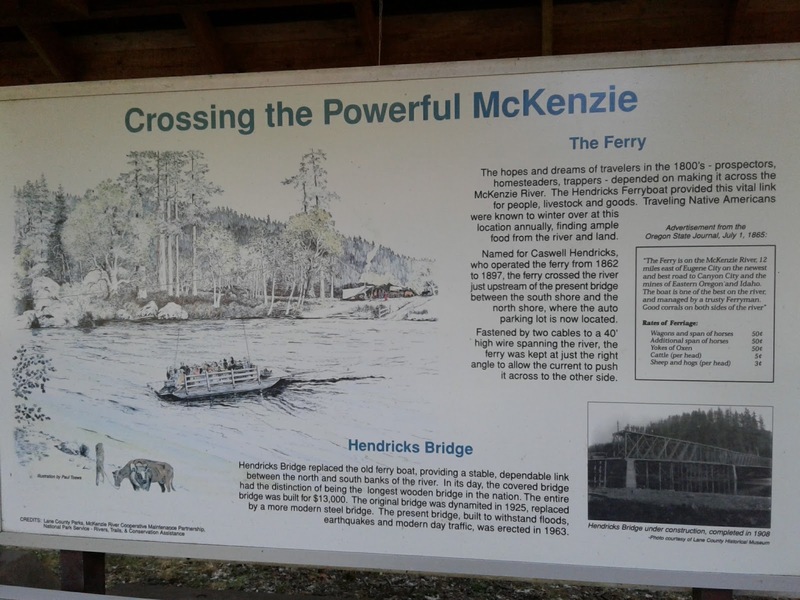 July 16 - Today we spent the entire day at Hendricks Bridge Park, a relaxing day of music, walking the girls, and trying to get more gigs. That night we went back to the River Stop, enjoyed a couple of drinks while listening to many locals jam funk, country, little rock. Not really any blues, but the musicians were all really great. I only saw the drummer and the singer change. It seemed they all either played together or knew each other. We sure enjoyed it. July 17 - Today we knew we were going to see Sis, a bass player that jammed with us back in Goleta, at M. Special Brewing, then again in Ojai at the Deer Lodge a couple days later. She invited us to come visit her in Oregon, so we decided to take her up on it. However, our plan was to get all our necessities out of the way; groceries, dumping our tanks, filling our fresh tank, etc. After a drive down a long private drive away past several orchards, a large legal marijuana farm, and dispersed between huge pines. 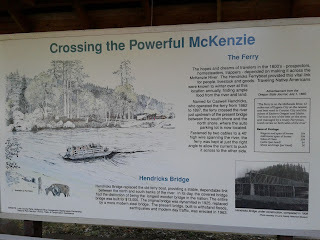 We reach Sis' and her husband Jeff's home. A beautiful older home, well maintained and meticulously decorated inside and modestly natural outside with lawn and tall trees. To one side a wide smooth, calm, glassy river with a deceiving current beneath the surface. On the river's edge, they have a floating deck with tables, chairs, and a kayak. On the opposite end of the property is two acres of Jeff's garden of fruits, veggies, and berries. 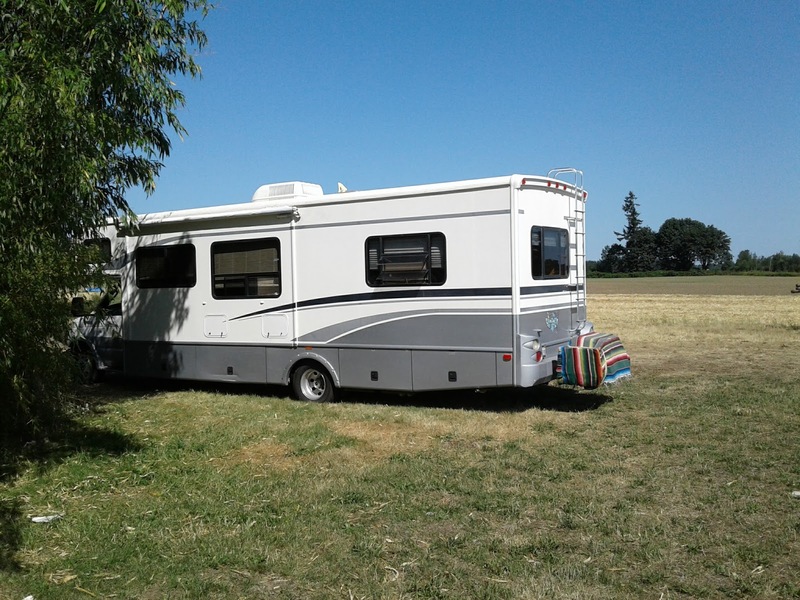 Within moments of arriving, Sweet and Jeff were out picking berries. After conversation and treats out on the river deck, we had a wonderful evening of conversation, story telling, like we all enjoy doing. Jeff BBQ'd Steelhead salmon their son had caught to perfection, along with an incredible salad, all homegrown. Sis and Sweet enjoyed some Sake, while I enjoyed my IPA, and Jeff enjoyed his favorite fresh berry drink. It is a special feeling to be brought into someone's life. We all pass through life so fast, that most too many of our connections and even relationship become superficial, we never have a chance, or take the time to get past the surface. When we do, it feels good. July 18 - Sis and Jeff had errands to run today, so Sweet and I spent the day on the RV slab at Sis and Jeff's paradise home working on music, letting dogs run, and trying to get more gigs. It was a really wonderful day so far. Later today we are going to set up or Bose PA system to show Sis how it works because she is wanting to possibly buy herself one. They have a wonderful barn where Sis wants to set up a jam area for all her musician friends can come and jam, hang out, etc. So, we're gonna test it tonight. Tomorrow we will be playing as Sweet Sixx, for the first time. We'll be playing a Summer Music Series in the Park in Eugene. It's an hour drive back, but hey, a gigs a gig. Plus, we absolutely love playing as a duo, but rarely get the chance, so we jumped on it. It's only a 2-hour gig from 4-6PM, so this will be fun, easy and probably meet some new people, who knows. That's it for now. We will keep you in the loop in a couple of days when we know exactly what we're doing. 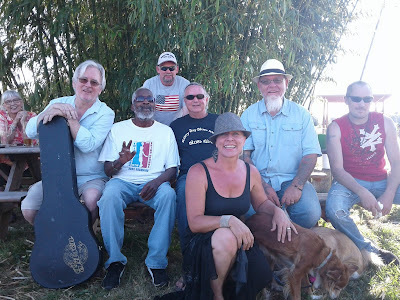 I do know we are playing Ashtown Brewing Company in Longview Washington on July 27, 6:30-9:30 PM and we are playing at The Buffalo Gap in Portland on the July 29, 9:00-Midnight. Labels: 2017 Tour, Corvallis, Eugene, Oregon, Road Report.